It’s estimated that 87% of Americans eat meat. Most of us have no clue about where our meat comes from. It’s cut up, wrapped in plastic, and neatly displayed in refrigerated cases in grocery stores. When you ask people why they eat meat, some will tell you they enjoy the taste. A recent study funded by the Humane Research Council found that 66% of Americans believe that using animals for food is necessary for human survival. Some will discuss the nutritional value. But the truth is that most of us have never asked ourselves why we eat meat; we just assumed that was the way it’s supposed to be. The consumption of meat has traditionally been seen as a sign of wealth and affluence. That’s why, as more of the world’s people acquire wealth, more meat is consumed. In some countries the tide is changing as people see that the more affluent are actually eating LESS meat, and not just because of their concern for animals. Former US President Bill Clinton has embraced a vegan diet as one that will lead him to lead a longer, healthier life. Others choose meat-free lifestyles out of concern for our planet, as methane from cows has a significant impact on our environment. To go without meat is much easier said than done. There are still many restaurants that don’t carry meat-free meals, but that tide is changing too. Burger King has the Morning Star Farms veggie burger. Chains such as Panera Bread, McAlister’s Deli and Atlanta Bread Company offer meat-free sandwiches, soups, and salads. It still requires effort to go vegan in restaurants, however. Companies are also getting on board and offering products that are meat-free while giving the consumer the “mouth feel” of meat. While you can always choose to make your own, some of you may be like me and not have the desire to cook from scratch after a stressful day at work. For us, there are two products I’d like to showcase. 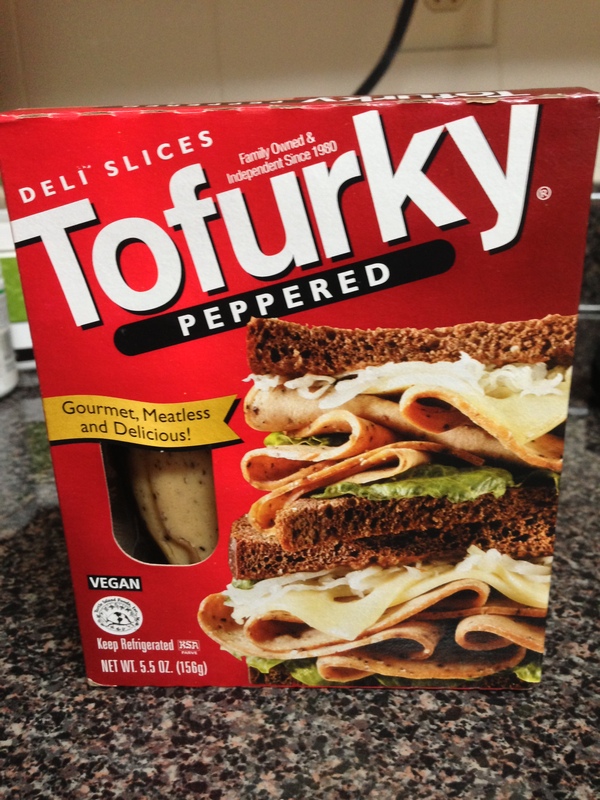 Tofurkey is a vegan meat substitute that you can purchase as a “roast,” but I like the deli slices. Tofurky with lettuce, tomato, and vegenaise sandwich spread is a quick meal to throw in the lunchbox. Why do I choose deli slices? I like the taste, I don’t have to deal with co-workers asking prying questions about my dietary choices, and they also are a good source of protein. One serving is 5 slices, and in those 5 slices are 13 grams of protein. Compare that to peanut butter, that has 8 grams of protein in a 2 tablespoon serving. And while I love peanut butter, I don’t want to eat it every day. When I want a burger, there’s another product I love. 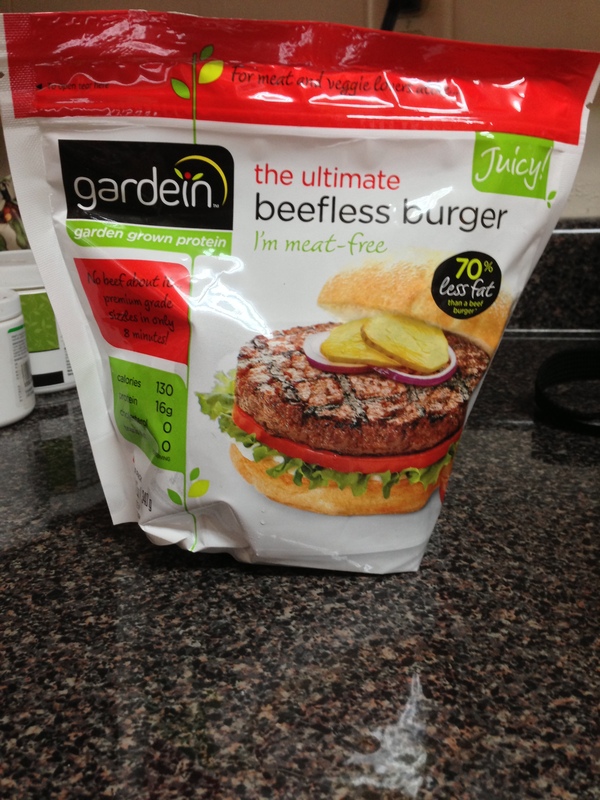 Gardein has a line of vegan meat substitutes that are tasty, have mouth feel, and are a good source of protein. There is 16 grams of protein in each of these meatless burger patties. Unlike the old standard Boca and Morningstar Farms patties, these are not small spongy patties that have the same color of meat but have no mouth feel. Recently I came across these in the frozen food aisle. 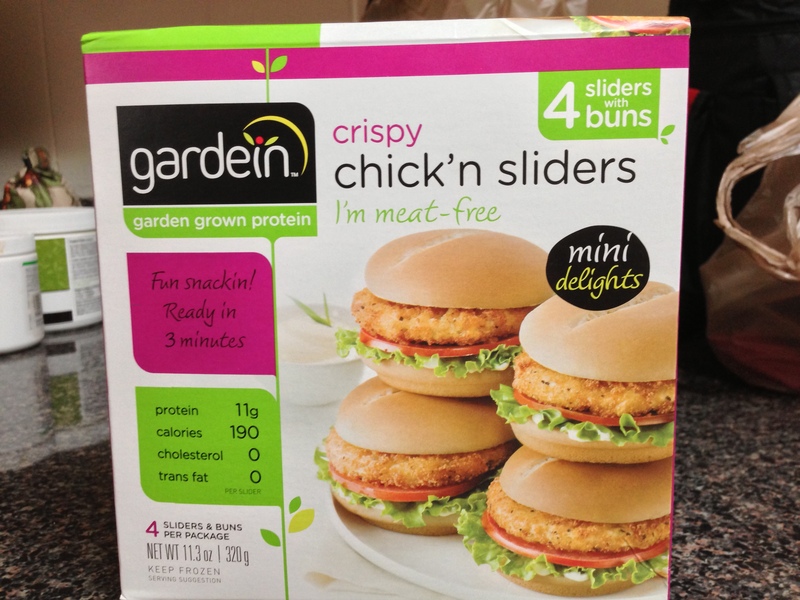 Gardein also has a beefless sliders product. Look at that- 11 grams of protein per slider. And honestly, how many of you eat just one slider? Gardein has many other meal choices that I can find even in the deep South, where not eating meat is akin to not loving Jesus. Your turn. What protein options do you choose for meat-free meals? And while we’re talking about eating meat, I want to share with you this really cool poem I ran across yesterday called When Chickens Cry. Check it out! Rumpy has gone on from this plane. We, his kitty siblings,continue to blog about animal welfare- and other things- at rumpydog.com in his stead. You can follow us on Twitter - @RumpyDog. And don't forget to LIKE our Facebook page! Thanks! « DeDe: Don’t Be Afraid to Ask for Help! I love meat and I can not imagine my meals without it, but we try to buy good quality meat, from our local butcher or reputable superstore. Rather have less but something what taste good! And that is your choice. But have you ever thought about why you eat meat? As a dog…meat is about all I eat…and I like it raw! Yay! And as more of us make these choices, we will influence others to also choose to at least eat less meat. It’s not at all difficult to avoid meat! I walked past a good looking beef steak today without any regret or desires. Vegan diet is delicious! I find that when I don’t eat meat, it doesn’t smell good to me. I walk past the seafood counter in the grocery and the smell makes me nauseous. Perhaps you will be a positive influence on him! I am not trying to tell anyone what they must eat or not eat. This is just a series to get us to think about what we eat and why we eat it. Sounds like you’re already doing that. @Russell Smith, I have celiac disease too and thought I had to eat meat or I would die. Well, Creator made me rethink this by making me too poor to afford meat. Now my protein comes from peanut butter and once a week, some boiled eggs plus I love beans. But I have discovered the “Against the Grain” gluten free frozen pizzas. They are a veggie delight! I also have a soy allergy, which means I am screwed forever to eat like a normal person. So we grow our own food. I won’t say I will never eat a bite of meat again because I make exceptions for food that would normally be discarded. The only thing worse than eating animal flesh is to let it die for us and then go to waste in the trash! It doesn’t affect demand because it has passed it’s use date. So for celiacs, I make this one exception. I only get stuff from the food bank so it really is the end of the line for what tiny bite of meat that I am gifted and I pray and give thanks to the animal. I also have neuropathy, fibromyalgia and polyps in my stomach, eating meat and wheat will aggrivate all these diseases. Red meat makes my feet hurt! BTW, I have a Malamute x Wolf. He is the most loveable, sweet dog in the world! Thanks for the thoughtful reply. I also have arthritis (similar to fibromyalgia) and neuropathic illness. What a pain! how cool for the two of you to run into each other! I hope you can share to help you live comfortably and healthily! Russell, I have arthritis too, and lots of other painful things I did not choose to list. As they say, I am not afraid of dying, it’s just the amount of pain it takes to get there. All the more reason to pray for the animals. The terrible and disrespectful things some sick humans do to them to cause them to suffer. Especially wolves and coyotes. Thank you for showcasing meat alternatives. I confess to being a meat eater, but the alternatives look tasty too. I’m not asking you to not eat meat. I’m asking you to be a conscious eater. That may lead you to not eat meat. But that is your choice to make. Oh, I didn’t mean for you to think you were asking me to change. I think its great there are meatless alternatives and I’m glad you gave some examples. Soy is not a good alternative for anybody, but especially if you have a thyroid disorder or disease as it blocks the cell receptors that thyroid hormone needs access to. Many people eat soy with no problems, but some people should not eat soy. I am a happy vegan. I do not judge people who eats meat. I was a meat eater in the past so, who am I to judge. But it is my belief that there is nothing wrong with getting information about what we eat. To give ourselves the choice and not to be manipulated and eat what we are told to eat. To be well informed, to learn where our food comes from, how it is made, what is the quality, is important and is a right that we all have, we should take it. Sadly many are just eating whatever comes their way, no matter the consequences, for the animals and for us. This is sad!!! It is sad. We eat what advertisers tell us we should. To be honest, it surprised me to know that there are many meat-less food in USA. And they look all delicious! As for protein, we love having soybean products very much and soybean is used for Miso soup, Tofu, Soy sauce, soy milk and lots of Japanese food and seasoning. Although it’s vegetable protein, we still consider it’s good for our health. Besides, it’s said that soybean works like estrogen in our body. We like to make our own black bean burgers and top them with a slice of cheddar and spicy ranch. But, if you are in a hurry we like the black bean chipotle burgers from garden burger. I don’t eat any animal or wear animal skin. We have options. Quorn products are good too. As I was in school, a teacher told me that the humans are only a highly developed species, because they eat meat. What a crap! Civilized vegetarian cultures who had a writing system already existed while the meat-eaters were still running around in their rough fur pieces and punched each other on the head with their bats. Some researchers say humans are more highly developed because we learned to cook food, especially meat. I don’t know. And I’m not so sure we’re the more highly developed life form. I do believe we’re the most aggressive. I like the taste of steak and lamp chops and have found that the veggie or turkey substitutes. (I’m Jewish and don’t eat pork.) Most of those products needed to be heated in a microwave. I don’t have one, nor will I eat food from a microwave. I am eating less meat at my doctor’s suggestion. I love that picture and the other ones on that website. I will definitely have to share them! If they were real pics, it would still be meat, so why not? Meat is meat. That’s why I am vegan, though. Thanks for the insight, great post. They are interesting, aren’t they? I think interesting AND disturbing, but I think it is all disturbing. Works for me! woo woo woo! Reblogged this on Sherlockian's Blog. That is the best message… be a conscious eater. Too many people take what they eat as a right, not a privilege. I’m not fond of food made in factories that comes in packages with long lists of ingredients and at the same time I need a certain amount of protein. I put more time and effort into feeding myself and my partner than ever despite all the convenience food options available. In the long run, those options are not convenient for the animal sources, nor for the long term good of people and the planet. One thing consumers need to get into their heads is that Big Companies (who use animal feed lots and factories) are not producing food because they like us, rather they like our money. If consumers make different choices, the Big Companies will follow… slowly and fighting us every step of the way… but we do have the power to change things. Those big companies do have the advantage of advertising that convinces us that they know best. To paraphrase one of our heroes, Temple Grandin, the question is not whether we eat meat or not but what kind of life we give tthose animals. A shorter life in excellent conditions is much preferable to a long one of misery. We would also like to make a point that many people forget about, and that is that farmers will not care for animals who are useless to us, so no meat-eating, no cattle… Focusing on quality of care is, to us, a much more important point. I agree. And while I have no beef with the farmers around here whose animals graze happily in the fields, I know that once their animals hit the feed lots, it’s a different story. And they get it much better than chickens and pigs do. While I respect vegans for their choices I personally wouldn’t. My mum is coeliac and allergic to dairy so much of that is cut out of my diet. I don’t like eggs simpley because when I did a day in the life of an rspca inspector for my radio work at college, they were shutting down an illegal battery hens barn. It was horrendous and I can’t even stomach free range or eat chicken. I love gammon and bacon and sausages too much to change fully but like you said, we should all think more about what we are eating. I typically eat a raw vegan diet during the day while I am at work and then may or may not have meat when I have dinner with my wife. I think we should eat like our primitive ancestors. I don’t believe they were hunter-gatherers but rather gather-hunters and ate meat when it was difficult to find other food. As we know, humans don’t typically expend more energy than needed and eating plants is much easier than hunting mammoth. True. We also tend to re-write our past to justify our current actions, which may explain why we’re seen as mighty hunters. You need that meat dress of Gaga. People must analyze what their body needs to be healthy – everyone is different – and different climates/jobs can mean different diets are needed. We eat far less meat than before – it just feels “heavy”. But I do feel meat/chicken from family mindful farms is better than huge factory farms if you want meat. And the fear and anxiety of slaughter houses is bound to affect meat. Progress is not always better. Want to get regular email from Rumpydog? Then follow my blog! Just click here.